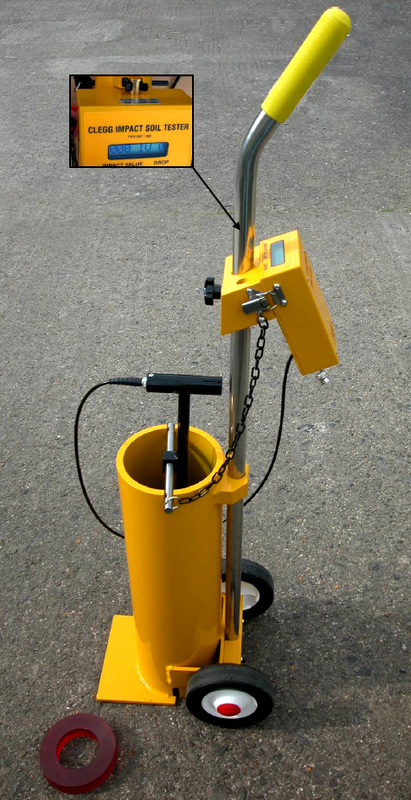 The 20Kg Clegg Impact Soil Tester manufactured by SDi is pictured on the right. 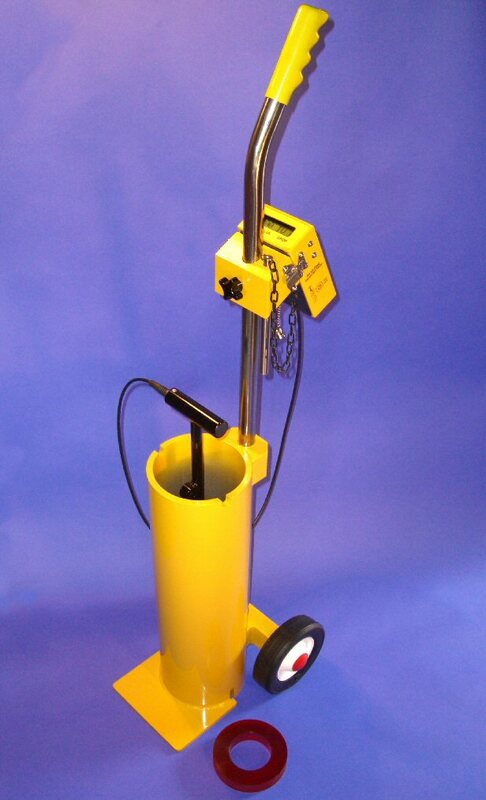 This model is designed for use on hard materials such as those employed in roadworks. estimating the traffic carrying potential of lightly surfaced low traffic roads. The Clegg Test involves dropping the hammer mass 5 times at each location and the 4th reading is used as the measurement of interest. The Surface Modulus of the flexible pavement is measured in terms of Mega Pascals and calculated as per Dr Baden Clegg’s original work ‘in the field’. 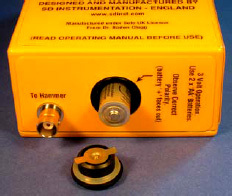 The measurement Clegg Modulus or CHM is displayed on the readout unit after the 5th hammer drop. Time and date stamped data logging of site tests and wireless transfer to PC is provided by the CIST/883 Readout Unit. The hammer has a mass of 20Kg and a diameter of 130 mm. 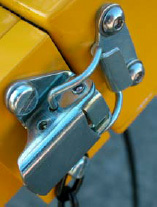 To simplify carriage and handling, the Guide Tube tube is fitted with wheels, making it into a pull-along cart. 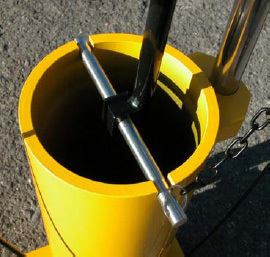 If required an optional 10Kg hammer mass can be provided instead of the 20Kg hammer. 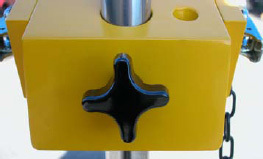 The Readout is fixed to an adjustable mount that can be moved in height and rotation to suit the user. CIST/883/20K/Stor/Blu. (20 Kg) or CIST/883/10K/Stor/Blu. (10 Kg). Vertical display with readout unit clamped to Adjustable Mount – Easily viewed. Up to 101 Impact Values (IV). Check Ring provided giving typical 22 IV Test Reading - Indicates Operation OK.
battery holder at base of readout, sealed to IP67. 12 month typical battery life. Single push button. Auto switch off after 5 minutes from last reading. Flash Memory for up to 10,000 5-drop test readings. Each field contains the 5 drop IV readings, time & date of each test, TREND result validity pass/fail flag & CHM. Bluetooth™ Wireless data transfer. No cables & hence hassle free connection to Windows XP PC or laptop. (Bluetooth™ USB Adapter for PC is provided). Comma Separated Variable (CSV) data for manipulation in third party packages such as Excel™. Up to 10,000 x 5-drop test storage & output. Software Selectable Clegg Hammer Modulus display from Readout LCD. Software Selectable TREND Algorithm checks inter-IV readings & Readout advises user if surface being tested has failed (Readout displays ‘ABORT’). PC Software provided from SDi to facilitate data transfer, real time test view, time/date setting and configuration set-up. Very easy to use. Type CIST/20/WTS/09. Wooden case for storage and protection in transit. 123 x 41 x 41 cm. Instrument weight 30 Kg. Packed weight in case 50 Kg. SDi use Portable Document Format (pdf) to publish and distribute documents on this site. This format allows you to download documents and to view and print them for your own use. You will need to install Adobe Acrobat(R) Reader software from the Adobe Corporation if you do not already have it. The free Adobe Acrobat(R) Reader allows you to view, navigate, and print pdf files across all major computing platforms.